Washington, DCÔÇöFrom global warming to international terrorism, we all have fears about the future of our planet.┬á But whether youÔÇÖre more faithful or more skeptical, when it comes to shaping public policy, it couldnÔÇÖt hurt to take a tip or two from the academicsÔÇöright?┬á This week, a DC think-tank released its World Future Guide, with essays on the current state of politics by ten leading experts in various fields.┬á From different angles, theyÔÇÖre all focused on the same topic: Where are we headed, and what can we do about it? 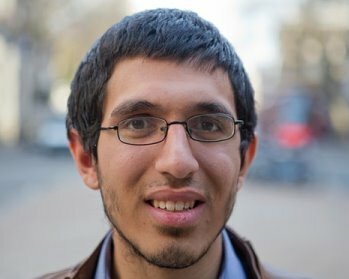 The authors are all Fellows at the Secular Policy InstituteÔÇöand ÔÇ£secularÔÇØ suggests that while they each come to the table with their own strong viewpoints, theyÔÇÖre big advocates of evidence.┬á And while feeding paranoia is easy when discussing heavy contemporary issues, thereÔÇÖs reason to believe that people want the facts.┬á Worldwide, 16% of the population claims no religious affiliation, making this belief group the third largest after Christianity and Islam.┬á In the United States, the ÔÇ£NonesÔÇØ are growing particularly strong in number as voters.┬á A separation of church and state has become increasingly paramount in countless regions of the globe, especially as LGBT people fight for recognition and atheist writers get threatened and murdered in Bangladesh and France. SPI connects prominent thinkersÔÇösuch as Taslima Nasrin, Elizabeth Loftus, A.C. Grayling, and John McWhorterÔÇöwith the worldÔÇÖs leading decision-makers.┬á So the Guide will be as much for politicians as for public consumption.┬á It is a collection of findings and recommendations on trends in law, education, and healthcare, including practical advice on defense and surveillance technology, on the Islamic/Western ideology conflict, and of course, on the interplay of religion and government. Some tips you might take away from this digest: How about how to spot a dictatorship before it forms?┬á Or how to tease out the benign aspects of Islamic faith from those that encourage gender discrimination?┬á Or even how to reap the health benefits of certain, more adaptive religions, while avoiding the hazards of religious warfare?┬á Whatever you get from it, reading the Guide should be a win: YouÔÇÖll either calm your biggest superstitions about whatÔÇÖs to come, or youÔÇÖll arm yourself with all the information you need to duck for cover.┬á If you learn from what you read, you might even be able to help influence some positive changes on our lonely planet EarthÔÇöbefore itÔÇÖs too late. 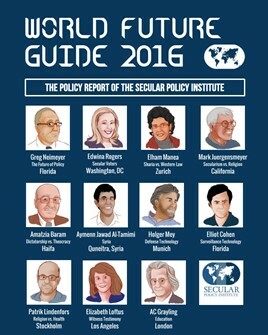 You can read the World Future Guide immediately on SPIÔÇÖs website at https://secularpolicyinstitute.net/survey/secular-policy-institute-world-future-guide-2016/.┬á Also on the site are Fellow bios and other resources, such as the Secular Resource Guide.